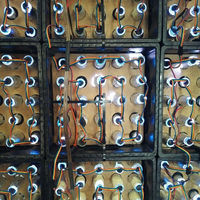 FlaschenTaschen is a 10’ by 9’ (3m x 2.75m) video display made out of clear glass bottles, milk crates, RGB LED strings (with a total of 1575 LEDs), and a controller board. Each bottle is capped with a single addressable RGB LED. The bottoms of the bottles act as lenses for the emitted light. The project has a German name as homage to c-base’s [http://matelight.rocks/ Matelights] project. 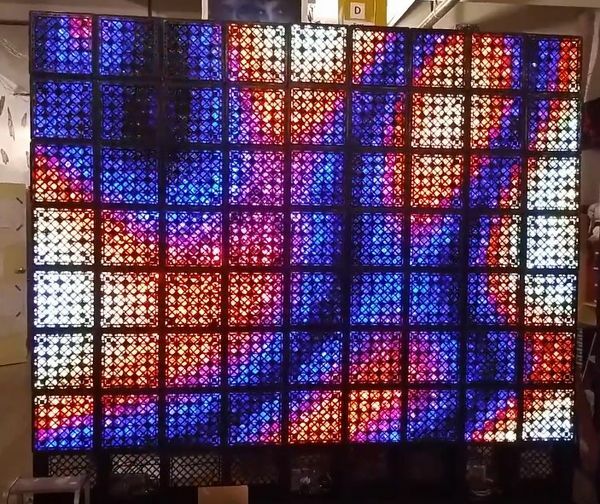 After seeing Matelights at Chaos Computer Congress, we were inspired to build a similar project at Noisebridge to present at the 2016 Maker Faire. 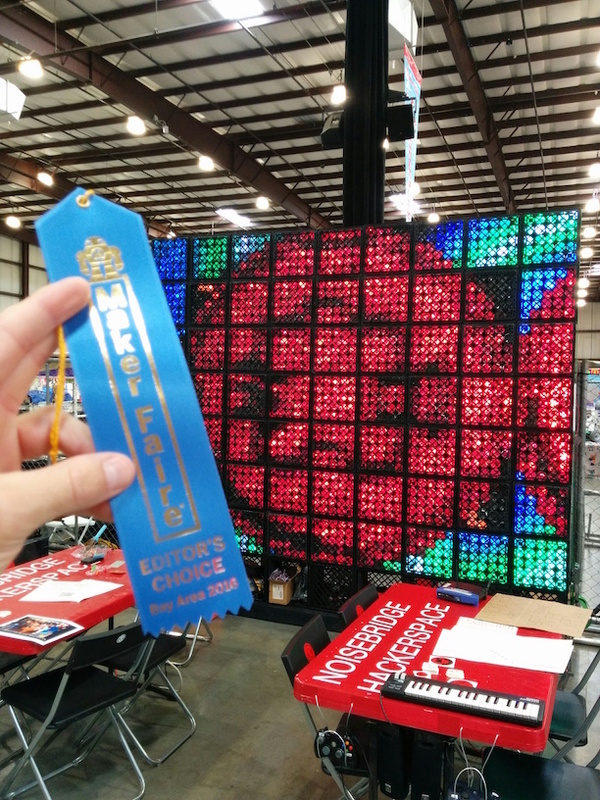 The Award Winning FlaschenTaschen is a 10’ by 9’ (3m x 2.75m) video display made out of clear glass bottles, milk crates, RGB LED strings (with a total of 1575 LEDs), and a controller board. Each bottle is capped with a single addressable RGB LED. The bottoms of the bottles act as lenses for the emitted light. The project has a German name as homage to c-base’s [http://matelight.rocks/ Mate-Light] project. After seeing Mate-Light at Chaos Communication Congress, we were inspired to build a similar project at Noisebridge to present at the 2016 Maker Faire. Our code and hardware that drives up to 16 LED strips from a Raspberry Pi is on [https://github.com/hzeller/flaschen-taschen Flaschen-Taschen github]. We only need 9 strips in this project, one for each crate column. The update rate is up to 160fps! Our code and hardware that drives up to 16 LED strips from a Raspberry Pi is on [https://github.com/hzeller/flaschen-taschen Flaschen-Taschen github]. 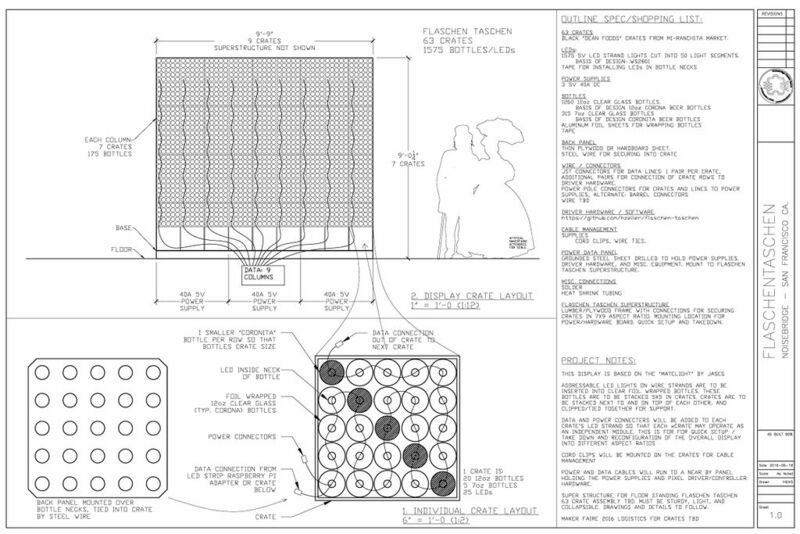 We only need 9 strips in this project, one for each crate column. The update rate of the full FlaschenTaschen display is up to 160fps! 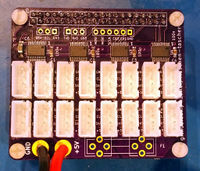 The breakout board, driving up to 16 SPI LED strips. There are sample utilities in the repository to send and scroll arbitrary images (including animated gifs), videos or text. There is a C++ class that you can use right away to send images to FlaschenTaschen including a couple of examples. It is also extremely simple to write your own client in any language that supports networking (See [https://github.com/hzeller/flaschen-taschen/blob/master/doc/protocols.md#protocols protocols section] in documentation). There is a C++ and Python client library that you can use right away to send images to FlaschenTaschen including a couple of examples. It is simple to write your own client in any language that supports networking (See [https://github.com/hzeller/flaschen-taschen/blob/master/doc/protocols.md#protocols protocols section] in documentation). *2_Disconnect all data connections, remember there are typically two per crate. Take a photo of how they are routed to the breakout board on the raspberry pi. *3_Remove the 2” green tie down strap. This is tricky there are two metal latches in line with the handles that need to be pulled in tandem to release the ratchet. While pulling on the latches it may be necessary to add tension to the tie down to get it to release, since we do not tighten it very much during install. *6_Stack the crates in stacks of 4. This is a good height to move with a hand truck. Make sure that the power jacks and date cables are not hanging over the edges of each crate before another crate is placed on top of it, so as to not damage the wires and connectors. *7_Stack up the base crates. These are also good for holding all the hardware, zip ties, bolts (in a bag), and cables for transport. *8_Remove the vertical supports from the base by unscrewing them. (iirc: this is done with a 7/16” wrench/socket.) Have someone hold the vertical supports while unscrewing. Keep all parts and set aside. NOTE how those washers are used. It is important that bolts not be able to rip through the wood. *9_Flip the base over. There are three bolts in the center that hold it together. Remove these. *A_Bring tools. Wrenches for the bolts, a screwdriver for the tops of the vertical supports, and a ladder. *B_The crates have an orientation. At the forward edge (display side) of each crate there is Velcro. The hook side should be on the top and the loop side should be on the bottom. This is typical for all crates except the base which only have the hook side Velcro on the top. *D_Try to align the forward faces of the crates as best as possible, but realize that it will never come out perfect. If a column is going out of vertical the crates above can be installed a little fore or aft of the face of the display to make up for it. *E_People have already sent images of genitalia to be displayed on the screen, so get over it. teh blinky RGB LED's are driven by a [[WS2801]] chip, that uses a clock (green) and data (white) line, that are operated similarly to APA102's, but are not identical in practice.